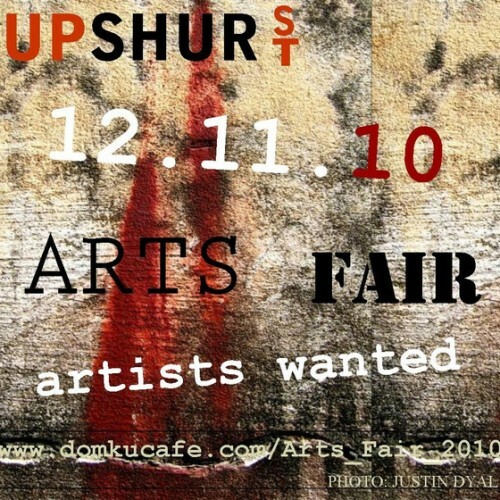 “After a year off, the Upshur Street Arts Fair, hosted by Domku Bar & Cafe, is back on for 2010. This year’s event will take place Saturday, December 11, from 11a-4p. This year’s fair will be co-hosted by CoreHaus DC, Upshur’s most recent retail addition. 1. You have to be a DC-area based artist. 2. Your work must fall within the visual and plastic arts. 3. Your work must be all self-made. 4. Your items can be moderately priced. The cut-off date to sign up is November 20, so don’t delay! *Special consideration will be given to artists using recycled materials.